Oh, hello winter. Happy you could join us. Not. 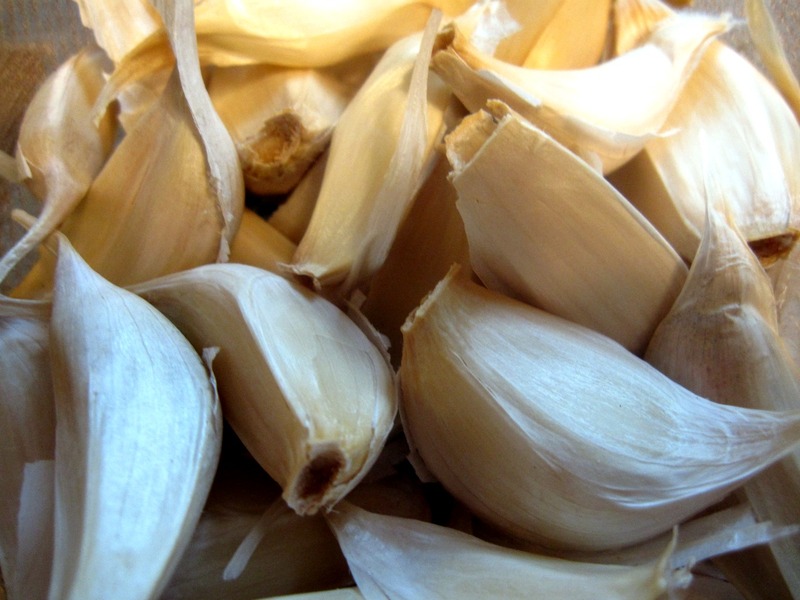 It’s amazing how many people I know, including my own grandfather, who are put off by garlic. Beautiful, pungently perfumey garlic. Even the most fragrant of baked goods has a hard time beating the scent of garlic being sautéed in butter and olive oil, a scent that shouts, “hey, I’m cooking!” Although my mom, like me, is likely to add extra garlic to anything she makes, never counting the cloves, it is from my dad for a change that I acquired my taste for the stinking rose. He can do something even I balk at: eat raw garlic cloves. But this is the kind of garlic dish that wins over those who don’t go gaga over garlic every time. 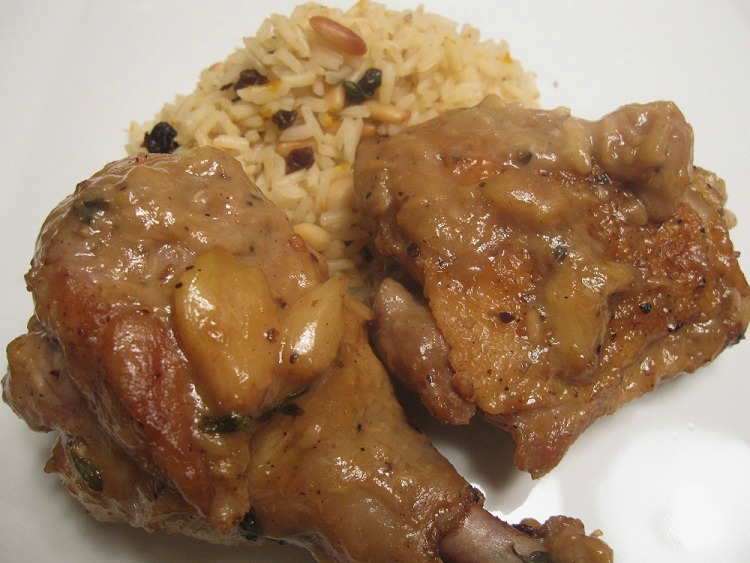 The idea is that by braising the forty — yes, forty — cloves with the chicken, they show their true colors. They break down, they caramelize and they mellow into sticky-sweet bites that flavor the complex cognac-spiked sauce. Although one might be tempted to tuck pieces of the fall-off-the-bone tender chicken atop creamy mashed potatoes, I, like Ina Garten apparently, find that this dish goes best with something bright to play on the garlic’s sweetness and cut through the sauce’s richness. Couscous is a classic paring, but, unfortunately, no one I know seems to like couscous, while I appreciate just about any pasta or grain. I find myself making a lot of rice pilafs. I don’t usually do orange in my cooking, but I like to serve this with my rice pilaf scented with orange and thyme and studded with currants. May your winter be warm and garlicky. Dry the chicken with paper towels. Season liberally with salt and pepper on both sides. Heat the butter and oil in a large pot or Dutch oven over medium-high heat. In batches, saute the chicken in the fat, skin side down first, until nicely browned, about 3 to 5 minutes on each side. Turn with tongs or a spatula; you don’t want to pierce the skin with a fork. If the fat is burning, turn the heat down to medium. 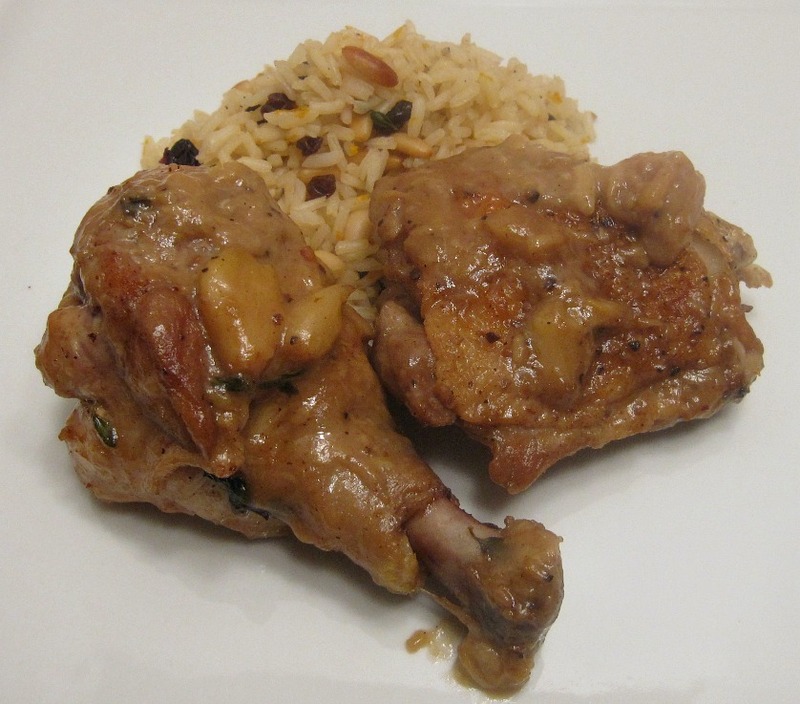 When a batch is done, transfer it to a plate and continue to sauté all the chicken in batches. Remove the last chicken to the plate and add all of the garlic to the pot. Lower the heat and saute for 5 to 10 minutes, turning often, until evenly browned. Add 2 tablespoons of the Cognac and the wine, return to a boil, and scrape the brown bits from the bottom of the pan. Return the chicken to the pot with the juices and sprinkle with the thyme leaves. Cover and simmer over the lowest heat for about 30 minutes, until all the chicken is done. Remove the chicken to a platter and cover with aluminum foil to keep warm. In a small bowl, whisk together 1/2 cup of the sauce and the flour and then whisk it back into the sauce in the pot. Raise the heat, add the remaining tablespoon of Cognac and the cream, whisk, and boil for 3 minutes. Add salt and pepper, to taste; it should be very flavorful because chicken tends to be bland. Pour the sauce and the garlic over the chicken and serve hot. Sounds so warming! I never shy away from garlic, so I would be all over this dish.